"Haunted by the freak accident that killed their father when they were children, Jim and Bob Burgess escaped from their Maine hometown of Shirley Falls for New York City as soon as they possibly could. Jim, a sleek, successful corporate lawyer, has belittled his bighearted brother their whole lives, and Bob, a Legal Aid attorney who idolizes Jim, has always taken it in stride. But their long-standing dynamic is upended when their sister, Susan—the Burgess sibling who stayed behind—urgently calls them home. Her lonely teenage son, Zach, has gotten himself into a world of trouble, and Susan desperately needs their help. And so the Burgess brothers return to the landscape of their childhood, where the long-buried tensions that have shaped and shadowed their relationship begin to surface in unexpected ways that will change them forever." 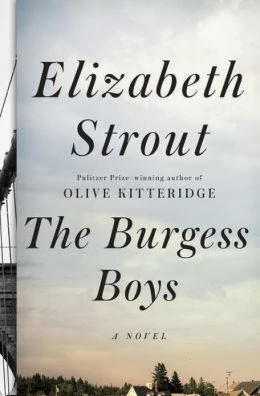 I have to admit, I was a little nervous about reading this story because, unlike so many others, Olive Kitteridge was not a book I enjoyed very much. Perhaps if I were to re-read that story with the same mindset as I did this one, I might like it better the second time around. Last year in my book club, we read a story that I couldn't get into; and I remarked that I didn't feel as though there was a purpose to the plot; and that I couldn't figure out exactly what the plot even was. One of my friends remarked that the story we were reading was character driven as opposed to plot driven. It wasn't about WHAT was happening in the story it was about to WHOM it was all happening. The Burgess Boys, to me, is written in the same way. The story is not about what is going to happen to Zach and his punishment for the crime he committed, nor is it even about the accident that occurred when the Burgess boys, Bob and Jim, were younger. However, those events are instrumental and necessary in developing these main characters in the story. The author presents and develops each character in such a manner that you find them desperate, despairing, modest, humorous, and loving...in other words, real. She gives each character a depth of humanity that you may not like and may even find discouraging and reprehensible; but is nevertheless what makes them appealing to read about. They are characters you want to hate, they are are characters you want to understand, and they are characters you can't help but hope might get a happy ending. These are characters that allow us to see and reflect on our own lives with all the triumphs, tragedies and mistakes that come along with this journey we are all on. I think we all have either a little bit of Bob, Jim or Susan in us. The peripheral characters of Mrs. Drinkwater and Abidkarim and Margaret are also woven very well into the story as well to become necessary members of the canvas. Finally, it isn't as though there's no plot or series of events that takes place in the book. Connecting the story with the Somali culture and community was powerful and educational.